So when we moved into our house, the bathroom was one of the rooms that had been redone the most recently. It looked new in that dark eighties kind of wood. It had a great linoleum with pastel blue accents. 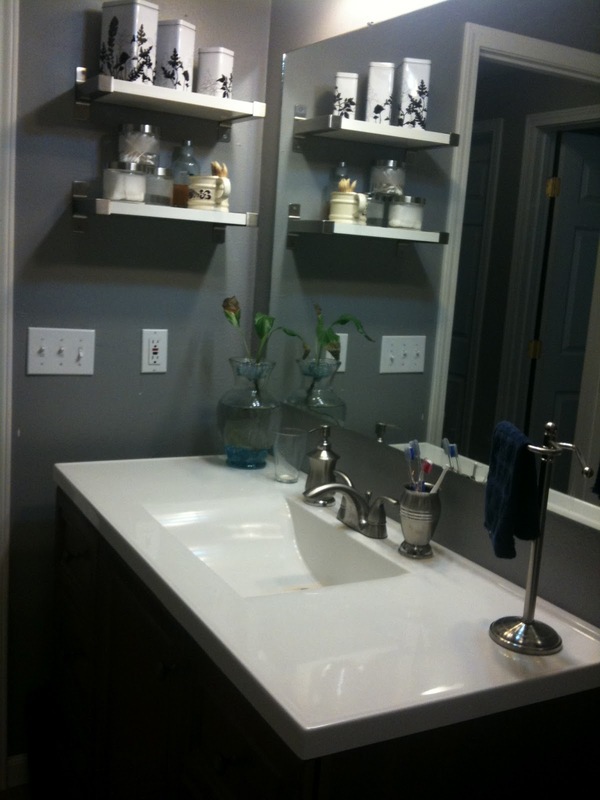 There was the large oversized mirror and a wood grained laminate countertop. You can see more before pictures on the “Our House” tab. This past year we knew that we were going to re-do the bathroom, but in the meantime I got impatient and wanted to update it. 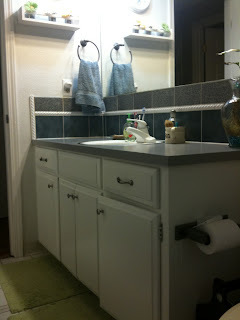 I wanted to try out painting cabinets, as we are thinking of painting our kitchen countertops this summer. I wanted to see how they would hold up to general wear and tear, plus I was hanging out in the paint aisle at Home Depot (everyone does that right?) and saw that there was laminate paint. I thought that how cool was that? I could update my lovely, and I do mean lovely, fake wood counter to something more neutral. Plus the paint for the countertop was only $20, and we already had the white paint and brushes. First we removed all the old hardware. I also used TSP to wipe down/clean the countertop and the cabinets. That actually took a while. It’s not that they were really dirty; everything was just shaped funny and hard to get at. I pulled the drawers out and painted those in the garage. Here is the handsome husband helping me with removing the old doors. Also, checking things out is our cat Schroder, who wants to make sure that the bathroom will still be his domain when its all done. I used a small roller to roll the primer onto the countertop. I also used the same small roller to roll the laminate paint on. I did two really thin coats on the countertop, and two thick coats on the cabinets (hey, I did not want to be there all month!). I let each coat dry for 24 hours, which is a lot harder to do than you think when your house only has one! bathroom. Since we were just going to pull everything out of the bathroom in a few months, I just tapped off the sink and the trim. It actually worked great. I know shocker right? I was surprised too. 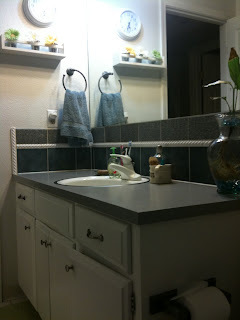 I just picked a grey blue color for the countertop as it mostly went with the tile already in the bathroom. I went to Lowes and bought the cheapest door pulls that I could find. All told they only set me back about $15 dollars. When we renovated the bathroom, I kept the new knobs. I need to think up a fun project to do with them. I still had most of the quart left after painting the countertop, so a little goes along way. The project only set us back about $50 if you count the cost of the rollers (hey those are expensive!). It was a fun way to immediate change and update the bathroom without any serious remodeling. Plus, it only took about a week. 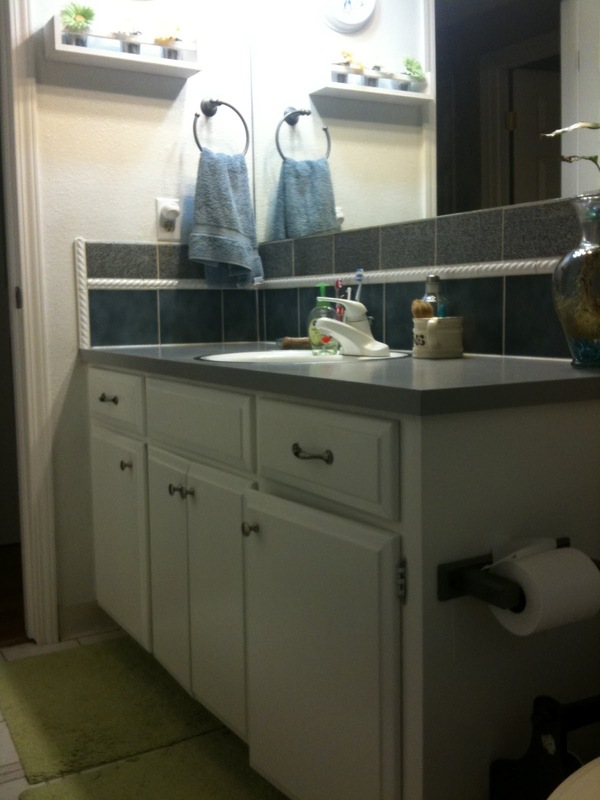 Here are pictures of the bathroom after the painting was done. It actually looked way better. It also looked quite a bit larger. 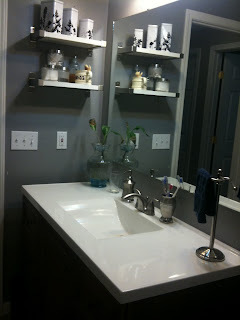 Now, here is the honest truth though, I hated the painted countertops! That laminate paint did not work! Anytime the cat jumped on top of the counters, he scratched it. Fingernail polish remover just wiped it away. Husband placing items on the top of the counter-scratched it. Maybe I did something wrong and it needed more layers, but that counter did not hold up under pressure. It was totally fine though, because we only had it for 6 months. Just in case you lost hope over that laminate paint, here is a sneak peak at our new bathroom! New countertop, new vanity, new everything. We literally ripped that bathroom down to the studs and put it back together in three days. However that information will just have to go into another post. For right now, I need to get started working on my thesis. My master’s degree is calling me and letting me know that it needs to be finished soon!